Superior Spider-Man #8, the second part of the “Troubled Mind” arc, does something that no previous issue of Superior has truly nailed yet – the comic features a true moment of redemption for Spider Ock, while also maintaining the overall loose cannon/prick-ishness that has defined his personality through the title’s first seven issues. I find the timing of this development to be critical, because if the next issue is indeed the “game changer” that Dan Slott and Marvel keep promoting it as, and if the game changing event is that Doc Ock finds a way to completely vanquish Astral Peter from the recesses of his brain (as I suspect is going to be the case based on the teasers in the May solicitations), then now is as good of time as any to finally show a truly heroic side of Marvel’s new flagship character. Trust me, I get that Marvel/Slott are trying to tell “new” kinds of stories within the context of a Spider-Man comic, and for the most part, I’ve really enjoyed the “Dying Wish” to Superior transition over the past six months. I am both prepared and okay with the fact that this status quo is going to be maintained for a considerable amount of time – at least through the summer and most likely longer. But while I’ve enjoyed the stories, I found my patience getting tested in some ways the past there issues. We saw Spider-Man kill Massacre in cold blood, beat the stuffing out of two guys who had basically punked him in a YouTube video, and finally physically confront a “villain” in Cardiac, who’s really just a kind-hearted guy who goes about carrying out his mission in underhanded ways. 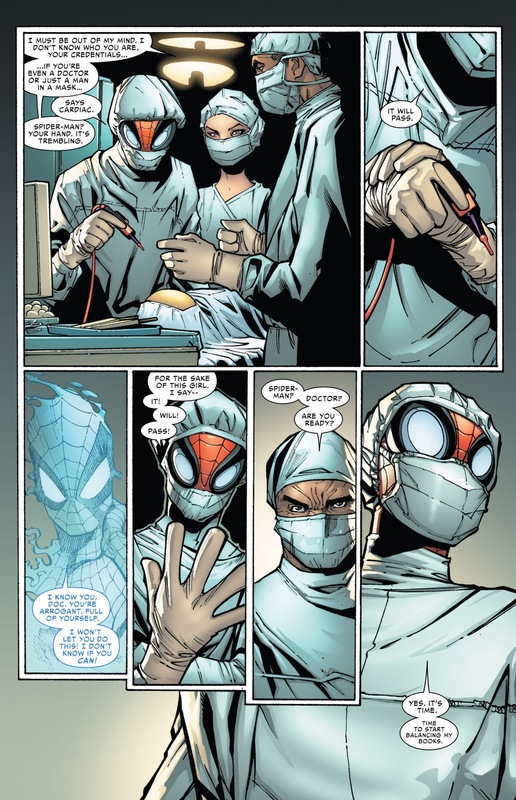 The ending of Amazing Spider-Man #700 indicated to me that Doc Ock had something to learn and embrace about Spider-Man that would be more fully fleshed out in Superior. Instead, that angle has been touched upon with more consistency in Avenging Spider-Man and in the Superior #6U Age of Ultron tie-in, while Slott’s Spider Ock has been more interested in demonstrating exactly how he’s “superior” to his predecessor. Again, I’m not saying I didn’t enjoy these comics, but this premise has an expiration date. The events of Superior #8 have pushed this expiration date back for the time being. Spider Ock’s redemption in this issue works on two levels. For once there’s the realization that Cardiac isn’t as interested in stealing his technology as he is in healing some young kids who had some pretty serious diseases. There’s the satisfaction of Otto putting aside his own ego when it comes to machines and science for the greater good, especially since it was his own actions in the “Ends of the Earth” arc last year that exacerbated the situation for this little girl. But ratcheting up the drama even further is the fact that Astral Peter’s mistrust of Otto is flat-out misguided. Slott is very smart here in demonstrating that if Peter was fully capable of asserting physical control over his old body, there would have been the blood of a child that otherwise would not have been saved on his hands. 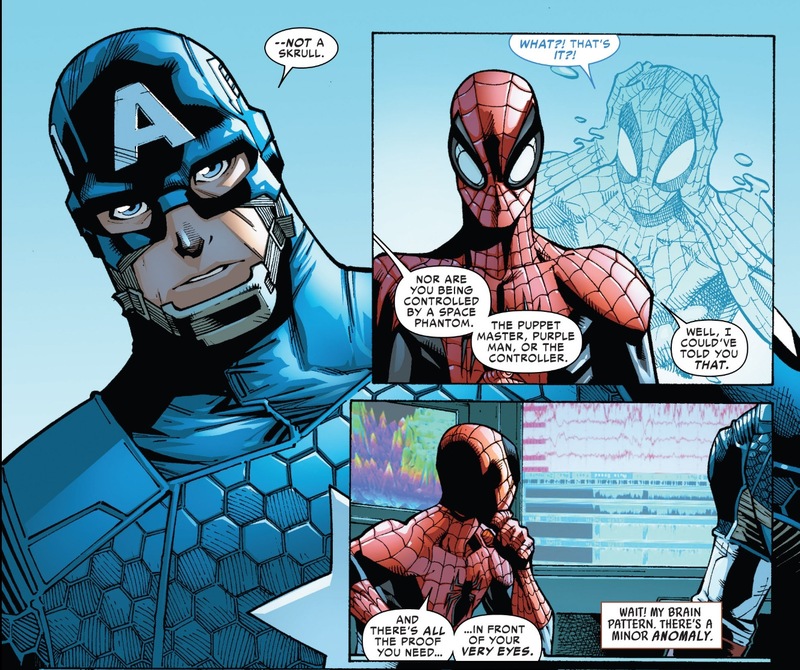 In every previous confrontation, Peter’s either commented on or physically interfered with Spider Ock to prevent a regrettable action (unjustified violence, murder, etc). This time, he has to accept the Spider Ock is using his power for purely good reasons. 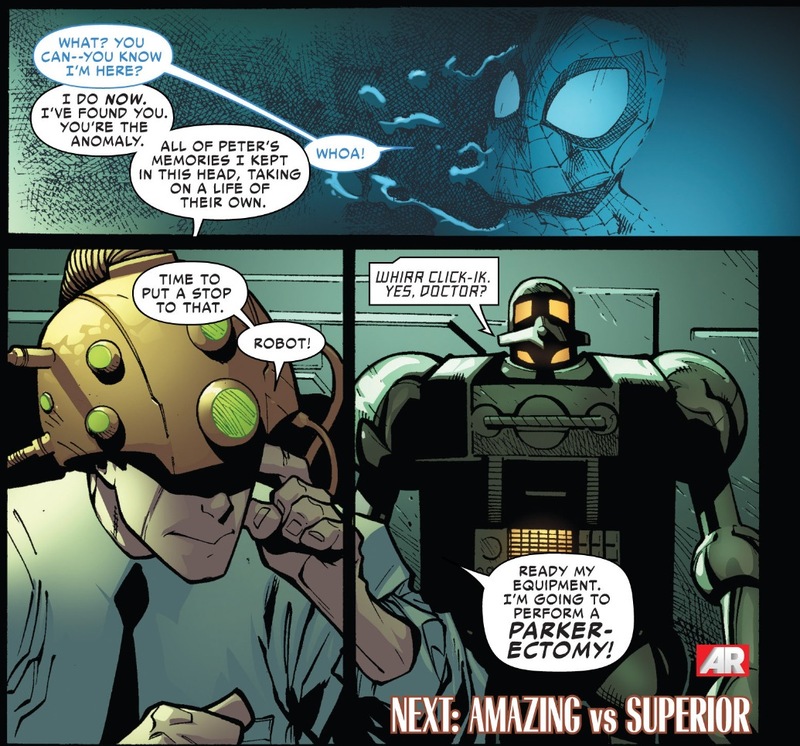 While Slott has used Otto’s voice to point out Peter’s shortcomings in the past, the reader was conditioned to believe that Doc Ock’s “enhancements” to Spider-Man’s power were just a reflection of his hubris and ego. Now, after this issue, we readers are faced with a very interesting dilemma regarding the state of Spider-Man: Yes, Peter is the moral center and has been via the pages of Spider-Man comics for more than 50 years now, but if Otto is capable of combining his own intellect with the power of Spider-Man to enact sincere good on the world, then maybe it’s really not such a BAD thing that he’s the guy inside the suit right now. Granted, this entire premise can be flushed down the toilet in a heartbeat – all it takes is another instance of Otto murdering someone as Spider-Man, or laying the smack down on some pesky antagonist because he was having flashbacks about being bullied as a kid. Then there’s the whole “Parker-ectomy” Otto was promising at the end of the issue that looms very ominously for the future of Astral Peter. But just as Miles Morales has seemingly ingratiated himself into the Ultimate universe as Peter’s replacement, there’s a chance that the same could be said for Doctor Octopus of all people. I had my doubts throughout this entire series, but Superior #8 is making me rethink things. As much as I liked this issue, I was incredibly disappointed in how Slott choice to resolve the Avengers-suspect-Spider-Man-is-someone-else story. 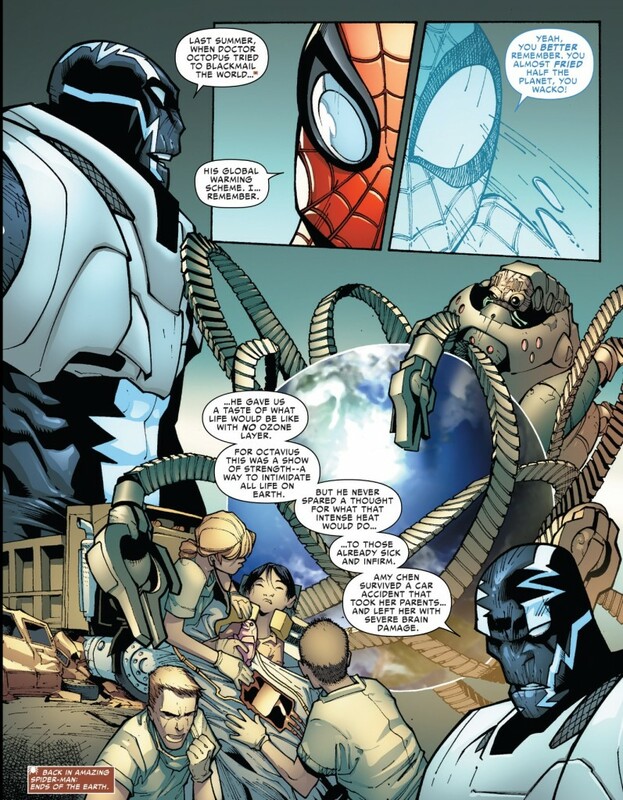 It was clear as day that Slott had painted himself into a corner here and rather than develop a resolution that could adequately serve the story, he presented us with a cheekily-written “swerve” (Spider-Man is definitely not a Skrull, nyuk, nyuk) that does nothing but make “Earth’s Mightiest Superheroes,” look like a bunch of morons, while preserving the Spider Ock character for at least a few more months of activities. We’ve been hearing for months now that Slott and Marvel are 100 percent certain that Miguel O’Hara, aka, Spider-Man 2099 is going to be appearing in Superior sooner rather than later. In Superior #8, we have Carlie Cooper, who knows for certain what exactly is going on with Peter and Otto, talking to a mysterious man in shadow on the phone. Could this be Miguel, and if so, I wonder how exactly Slott/Marvel plans to use him going forward? I remember reading the first issue of 2099 as a teenager and being unimpressed by it, but I guess I have to give the series a second look in anticipation of where things may be headed. Similar to the first bulletpoint, Carlie’s “conflict” seems to be more of Slott serving his premise rather than his story. Here we have the one character who knows the truth about Peter and Spider-Man who could hypothetically end this arc in one well-timed phone call to the Avengers or Fantastic Four, but instead she’s gone full-Hamlet on us and is pontificating how to proceed and find “evidence” that supports here claims. I get that she’s a cop and must do things by the book, but it just seems like a utra- convenient plot development by Slott that lets his new toy in Spider Ock continue to exist without restrictions for the foreseeable future. 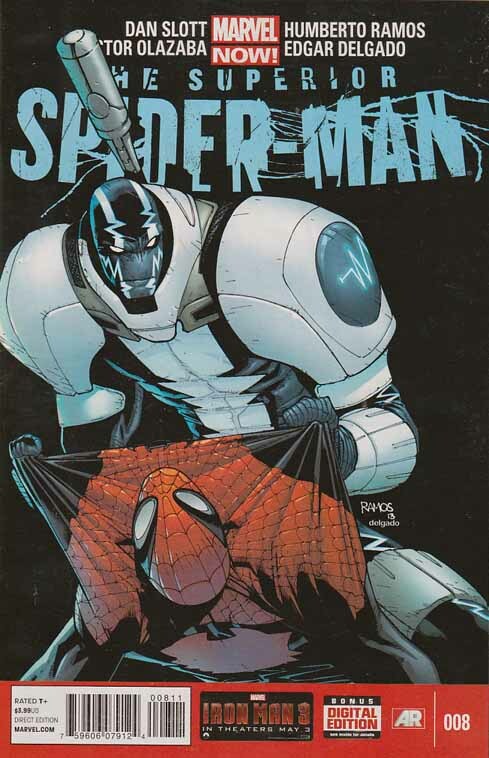 Quick programming note in that I talked about two “new” issues this week because starting Monday, I’m going to have the first post in a three-part series looking at an ASM arc from the past that prominently features Spider-Man and Tony Stark/Iron Man. I wonder why I might be interested in talking specifically about Iron Man on a Spider-Man site next week?